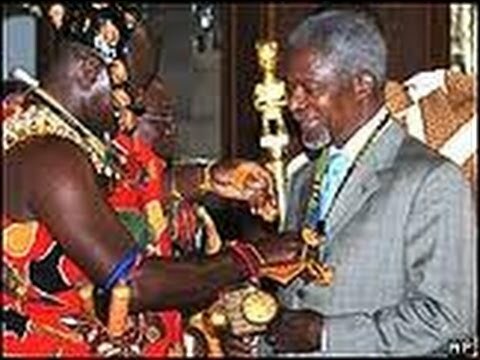 KUMASI, Ghana – Swathed in traditional kente cloth, U.N. Secretary-General Kofi Annan accepted Friday 16 August 2002 the highest honor granted by Ghana’s Ashanti people in recognition of his service to humanity. 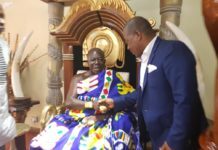 King Otumfuor Osei-Tutu conferred the rare title of busumuru, or son of the golden stool, on Annan at a traditional gathering of tribal leaders in Ghana’s second-largest city, Kumasi. 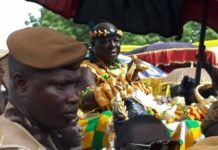 “Busumro” is the name of the golden sword used by the king to swear allegiance to the Ashanti kingdom at his coronation. 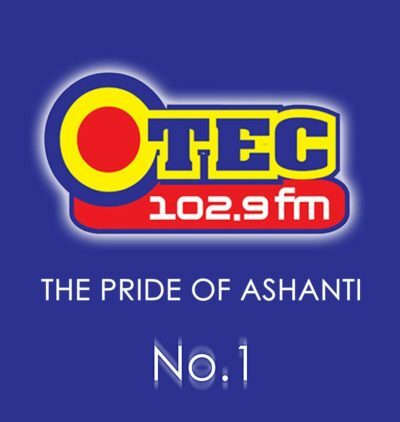 Annan, a Ghanaian from the Afante tribe, is the first to be granted the title since the Ashanti kingdom was founded in 1680. Accepting the honor, Annan said his achievements would not have been possible without the support of people throughout Ghana and the rest of the world. “I share this honor with all good people of the world through whose contributions we are able to get somewhere,” he said. Annan, a Nobel Peace Prize winner, grew up in Kumasi, about 300 kilometers (185 miles) north of the capital, Accra. He arrived in Ghana on Tuesday with his wife, Nane, for a two-week private visit. The couple attended a state dinner hosted Wednesday by President John Kufuor, where they danced with other dignitaries to rock and Ghanaian highlife music.